Was Skalat on the border between Poland and USSR before WW2? Is there a pre-WW2 map with Skalat? I am trying to confirm information from a 90-year old who reportedly crossed the former border between Poland and USSR during WW2 (July, 1941) at Skalat. In the immediate post-World War One period, Skalat was seized by local Ukrainian activists, who declared that the town was part of West Ukrainian People's Republic. Polish - Ukrainian tension escalated, and climaxed in the Polish–Ukrainian War. On April 23, 1919, Ukrainian activists murdered a popular Roman Catholic parish priest from Skalat, Rev. Walerian Raba, and on July 16, 1919, the town was captured by the Polish Army. 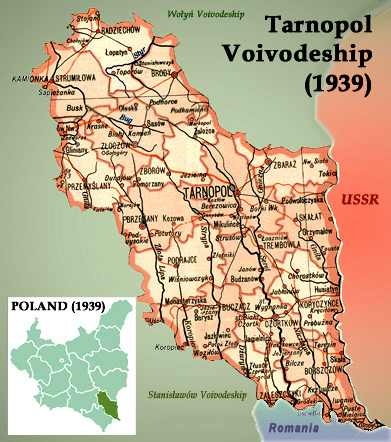 In 1923 Skalat became the seat of a county in the Tarnopol Voivodeship. There is also a Map in wikipedia where you can see, that Skalat is near the border to USSR (Ucraine). You see, the town is near the border and changed the ruler. Not the answer you're looking for? Browse other questions tagged world-war-two maps or ask your own question. In early WW2, how much of the merchant marine was American?